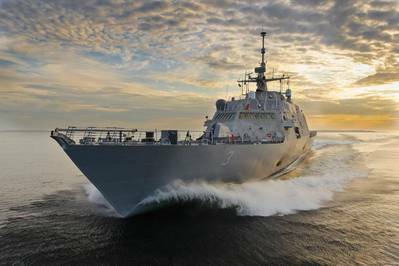 The U.S. Navy and its shipbuilding partners have incorporated lessons learned from the first two Littoral Combat Ships (LCS) in the design and construction of the follow-on ships. LCS 1 is the USS Freedom, built at Marinette Marine in Wisconsin by a team led by Lockheed Martin, and commissioned in November of 2008. The ship deployed to U.S. Naval Forces Southern Command as well as participated in the RIMPAC fleet exercises around Hawaii in 2010. Freedom is currently in a scheduled maintenance period in San Diego. Commissioned in 2010, USS independence (LCS 2) was built at Austal USA in Mobile, Ala., and recently called at Naval Station Newport in Rhode Island for the 20th International Seapower Symposium. Independence is conducting tests at sea with both the Remote Minehunting Vehicle and MH-60S Seahawk helicopter using the AQS-20 sonar in simulated minefields. Several ships of each design are under construction at the two builders’ shipyards. Fort Worth (LCS 3) completed builder ‘s sea trials in Lake Michigan on Oct. 24., and is due to be commissioned next year. Coronado (LCS 4) will launch next month at Mobile. Milwaukee (LCS 5) is under construction at Marinette, and construction of Jackson (LCS 6) has begun in Mobile. Murdoch said that criticism regarding the cost overruns of the first two ships was well founded. But thanks to a robust competition, the follow on ships will cost much less. “We have two great contracts in place to provide ships at a very affordable price, and maintain a stable design,” Murdoch says. The Littoral Combat Ship (LCS) is new kind of combatant designed to operate in the littoral—or coastal—waters of the world, to address the serious threats of mines, quiet diesel submarines and small, fast armed boats that can deny access to these waters. LCS is the first ship built to address these focused missions of mine countermeasures (MCM), anti-submarine warfare (ASW), and surface warfare (SUW), and can be configured for those missions by changing modularized mission packages. The ship itself has ample internal volume to carry mission packages to address one of the three focused missions, and these mission packages can be quickly changed to give the ship an entirely different combat capability depending on the specific threat being addressed. These mission packages come in containerized modules which carry offboard vehicles and sensors. Employment of off-board manned and unmanned vehicles at a distance from the ship allows the Navy to rapidly engage threats while the ship stays at stand-off ranges. The Navy had planned to select just one of the two competing variants to be the Navy’s choice for LCS. But in a surprise announcement last December, Lockheed Martin Corp. and Austal USA each received a fixed-price incentive contract for the design and construction of a 10 ship block-buy, for a total of 20 littoral combat ships from fiscal 2010 through fiscal 2015. The average ship target-price across the entire dual-block buy for the Lockheed Martin LCS variant is $362 million; and the average ship target-price for the Austal USA LCS variant is $352 million, according to Navy officials. The Marinette ship had some reserve buoyancy issues, structural cracks, corrosion problems in the vicinity of the water jet tunnels, and water was coming through the anchor hawse pipe in heavy seas. To provide additional buoyancy on LCS 1, buoyancy tanks were attached on the stern on each side of the stern door. In LCS 3, the hull was lengthened below the water line providing more buoyancy without the tanks, and space for an additional 10 percent fuel capacity. With the extra length, the ship is actually faster. "With that longer underwater hull, the ship is a little more efficient,” says Murdoch. “Just operating on the diesel engine alone, she's about a knot faster. We're probably one to two knots faster on the gas turbine (engines) alone than Freedom was." The LCS 1 design will have a more robust shaft seal system and improvements to the stern door leading from the waterborne mission zone top the sea so as to reduce the impact of salt water corrosion, as well as larger bridge windows. Design improvements will permit heavier loads to be carried on the LCS 1 stern ramp. This way the 11-meter RHIB can remain on the ramp between evolutions instead of being stowed and unstowed each time, a time-consuming task. “These are small ships with a lot of propulsion plant in them,” Murdoch says. Murdoch said LCS 2 construction required too many labor hours. The Austal ships now feature a more modular and economic construction process. Large blocks of the ship are built with all the installed piping and wiring, and are mostly complete and tested when fitted to the other parts of the ship. In addition, the LCS 4 centerline waterjets are larger so as to take full advantage of the General Electric LM2500 gas turbines. The Austal ship has also experienced corrosion problems. With the changes, Murdoch says both production lines should now be quite stable. The key to keeping costs down, he says, is avoiding changes. “We don’t introduce any changes we don’t absolutely have to,” he says.